3 or more Scatters in any position activate a Pick feature where players pick their feature bonus symbol either the Naughty girl or Nice girls. 4 Scatters give a 20x total bet prize, 5 Scatters give a 200x total bet award. 10 Free Spins will be awarded. Nice Girl symbols get replaced by Naughty Girls and any wins with the Naughty Girl awards a 3x win multiplier. When the Naughty girl is chosen she could also reveal 1 of 3 free game bonuses. 12 Free Spins will be awarded. Naughty Girl symbols get replaced by Nice Girl Wild symbols and wins pay 2x when a Nice Girl Wild forms part of the winning combination. If the Nice Girl is chosen she could also reveal 1 of 3 free game bonuses. There is also the option to place a side bet which guarantees a feature may be triggered within 26 spins! 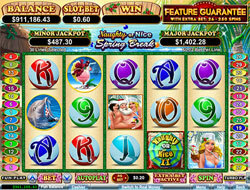 Players have the option to place an Extra Bet of 10 times a bet per line. Ensuring a feature will be triggered within a given number of spins. If a feature doesn't trigger randomly, the Feature Guarantee will trigger it for the player! Santa Claus and his pretty assistants should get pulses racing! Plus the rewarding bonus rounds should bring players back for more fun, naughty action!